Sometimes you need to solve many problems at once . . . with extreme prejudice. 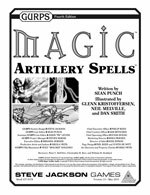 GURPS Magic: Artillery Spells arms wizards with the firepower to do exactly that! It beefs up GURPS Magic with 50 new spells for devastating vast areas and hordes of foes. Nearly every magical college gets an offensive upgrade! Unleash a toxic Cloud of Doom, rock out with a Withering Wail, bend reality into a Hell Zone, or inflict the pain of a Punishment Circle. Artillery Spells also offers advice on using mass-damage spells in the campaign, keeping them balanced, and devising your own. Blast your enemies . . . before they blast you! 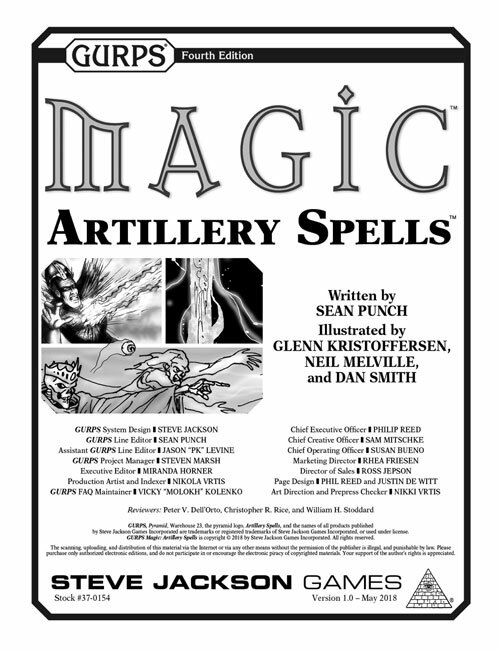 GURPS Magic contains the core system needed to use Artillery Spells. Limit your destruction to a single target, with GURPS Magic: Death Spells!